Deeply understanding that ethnicity is an important component of one’s identity, facial plastic surgeon Dr. Sadati is skilled at refining the appearance of the nose while maintaining the qualities and characteristics representative of his patients' heritage. Vastly experienced in the nuanced field of ethnic rhinoplasty, Orange County ethnic rhinoplasty surgeon Dr. Sadati's expertise will immediately put you at ease. Whether you are interested in widening or narrowing the nose, decreasing the size of the nose, reducing a hump or increasing nasal tip refinement, Newport Beach ethnic rhinoplasty surgeon Dr. Sadati is fully qualified to address your unique concerns and give you the beautiful nose you've always wanted. Committed to achieving the most natural cosmetic results possible, Dr. Sadati believes the best outcomes occur when surgeons honor their patients' genetic heritage. As such, he is careful to consider his patients' exact desires and objectives -- as well as the nose shapes and features commonly found in their cultures. Having performed countless successful rhinoplasty procedures for discerning patients of Hispanic, African, Asian, Middle Eastern and Greek descent, Dr. Sadati possesses a rare ability to deliver rhinoplasty results that accentuate his patients’ natural beauty, achieve their precise cosmetic objectives and preserve their ethnic identity. Accomplished at addressing his patients' cosmetic concerns while preserving the beauty of their culture, Newport Beach ethnic rhinoplasty facial plastic surgeon Dr. Sadati has earned a reputation for providing beautiful results in ethnic rhinoplasty. Commonly performed under general anesthesia, Orange County ethnic rhinoplasty surgeon Dr. Sadati will begin the procedure by making precise incisions, either inside the nostrils or on the outside of the nose. He will then raise the soft tissues of the nose and reshape the underlying nasal structure to accomplish the cosmetic objectives discussed during your initial consultation. From there, Dr. Sadati will re-drape the soft tissue over the nose and close the incisions. 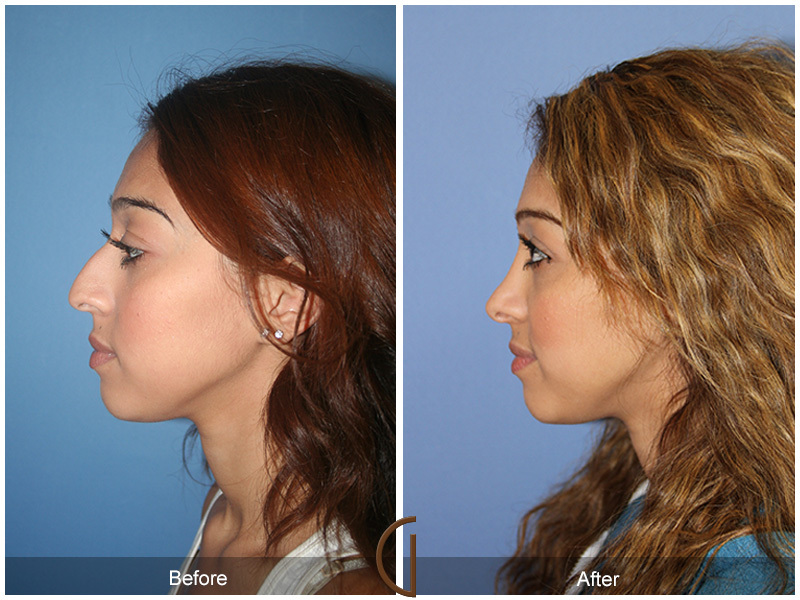 Depending on the complexity of your procedure, rhinoplasty can last anywhere from one to three hours. Immediately following surgery, you can expect to experience substantial nasal swelling and congestion. There will be a protective splint covering the nose, and you will return home to recover and allow the cartilage and tissues to heal. This initial recovery period should last about one week, at which point Orange County ethnic rhinoplasty surgeon Dr. Sadati will remove the external splint to reveal your new nose. Although there will be an immediate and significant improvement in the shape and size of your nose, the final results can take up to twelve months to fully appear. During that time, the nasal swelling is continuing to subside, and the tissues are healing to reveal the genuine appearance of your new nasal structure. During the beginning stages of recovery, you will be advised to avoid strenuous activity, swimming, wearing heavy glasses and engaging in activities that may place additional stress on the nose. During your post-operative appointments, Dr. Sadati will advise you on when it is safe to resume rigorous activities. If you are considering ethnic rhinoplasty, your first step will be to meet with facial plastic surgeon Dr. Sadati for a private consultation. During this meeting, Orange County ethnic rhinoplasty surgeon Dr. Sadati will carefully evaluate your concerns, objectives, facial features and cultural background as a whole. He will then thoroughly explain your options and compose a treatment plan designed to provide the precise cosmetic results you desire without compromising the features representative of your heritage. Distinguished by his commitment to the highest level of personalized care, Dr. Sadati will take the time to address your concerns, answer your questions and ensure you feel comfortable and taken care of throughout treatment. A leader in ethnic rhinoplasty with countless successful procedures, Dr. Sadati is among the most qualified surgeons to give you the stunning nose you've always wanted while preserving the beauty of your culture. As a double board-certified surgeon, Dr. Sadati is not only an expert in facial plastic and reconstructive surgery—he is also well versed in head and neck surgery. With this extensive knowledge in cranial structures, Dr. Sadati is fully qualified to expertly shape and refine the nose to deliver the precise cosmetic results you desire.